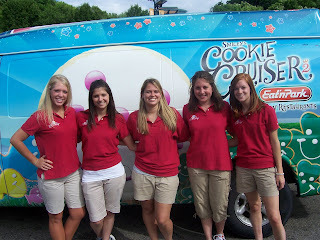 Summer is here, and that means that Smiley and his crew are hitting the road in Smiley’s Cookie Cruiser! Team Smiley will be attending community events and visiting Eat’n Park restaurants all summer long. Click here to see when they will be in your neighborhood, so you can stop by to decorate your own Smiley Cookie, play a game for a prize, or just say ‘hi’ to Smiley himself! Team Smiley will make sure you leave with a smile on your face. Hi, my name is Kristen and I’m a Business Marketing major going into my junior year of college. I love hanging out with my friends, going to the movies, and travelling (especially to the beach or anyplace warm)! Fun fact about me: I’m allergic to turkey. So, needless to say, my favorite Eat’n Park meal is NOT the Hot Turkey Sandwich! I’m a fan of the Breakfast Smile. My favorite Smiley Cookie shapes make their debut in spring: the Shamrock and the Bunny Smiley Cookies are my all-time faves. This summer, I’m looking forward to meeting lots of different people and sharing smiles with Team Smiley! KaylaHi, my name is Kayla and I am a college senior majoring in marketing and sports marketing. When I’m not working for Team Smiley, I enjoy traveling all over the world, scrapbooking, playing sports, and trying new things. Some interesting facts about me are that I have been to three continents and have even bungee jumped in the mountains of Switzerland! When it comes to Eat'n Park, my favorite meal would definitely have to be the grilled chicken salad. However, the ham and cheese omelette definitely comes in a close second. My favorite Smiley cookie shape would have to be the Halloween Cookie that comes out in October. I absolutely love the candy corn eyes! This summer I am really looking forward to becoming friends with the rest of Team Smiley and eating lots of Smiley Cookies! NicoleHey everyone, my name is Nicole and I am a new member of Team Smiley ’09. I am going into my third year of college where I major in Business Finance. I love to play soccer; in fact, I am a member of the varsity soccer team at school. In my spare time, I like to exercise and even play Nintendo’s MarioKart. I am a huge Pittsburgh sports fan, especially the Steelers!!! Some people would be surprised to know that I am ambidextrous, meaning I do things with both my right and left hand. My favorite Eat’n Park meal is definitely the Smiley Waffle. When I was younger, that is all I would order when my family went to Eat’n Park. My favorite Smiley Cookie shape would have to be the Black and Gold cookie; it just reminds me of Pittsburgh and all the awesome sports teams. This summer I am looking forward to traveling to all the great events PA, Ohio, and West Virginia, and handing out Smiley Cookies, of course. I hope to see everyone at Eat’n Park this summer!!! Hey everyone, my name is Tatum, and I’m heading into my senior year of college this fall. I’ll be graduating with a degree in Health and Organizational Communication. In my free time, I enjoy figure skating, volunteering, and shopping! I love candy and have quite a sweet tooth (this could be trouble since I’ll be around Smiley Cookies all summer)! I’m a fan of the classic round Smiley Cookie, and my favorite meal at Eat’n Park is the Chicken Noodle Soup. I’m excited to work with the other members of Team Smiley this summer, and I’m looking forward to becoming more familiar with all the neighborhoods where Eat’n Park restaurants are located. I’m Sarah, and I will be a senior in the fall, majoring in communication and minoring in history. I am an executive board member of Theta Phi Alpha and serve as elections chair for the student government board. For 14 years I have been riding hunter/jumper horses and taking part in small Pittsburgh area shows. People may be surprised to know that I have lived in Pittsburgh my whole life yet I've never ridden the incline....yet. My all-time favorite meal at Eat'n Park is the Shredded Pot Roast Sandwich (with fries and gravy of course), and my favorite Smiley Cookie shape is the Bunny. 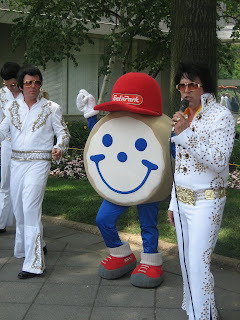 This summer, I am most looking forward to taking Smiley and the Cookie Cruiser all over PA, OH, and WV to celebrate 60 awesome years of Eat'n Park! 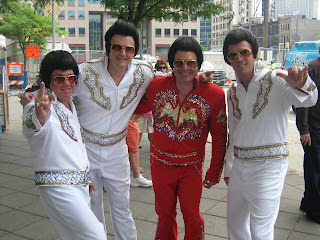 We surprised pedestrians in downtown Pittsburgh today when our team of more than 20 Elvis impersonators flooded Gateway Center and other downtown hotspots to kick off our Eat’n Park Rocks promotion. Why Elvis? Well, because Eat’n Park Rocks celebrates the fact that Eat’n Park has been rockin’ for 60 years, and nobody could rock like Elvis! All of our blog contributors, as well as many other Eat’n Park team members and executives, donned Elvis’ signature attire today. Even Jeff, our President and CEO, got in to character! Of course, Smiley is not one to be left out either, so he joined in by breaking out his sweetest moves. Check out the photos below to see Smiley and our “Elvi” in action! Our bloggers: can you tell who's who? A group of Elvi makes quite a spectacle! Smiley can rock with the best of them! As part of Eat’n Park Rocks, we will be rewarding our loyal guests with more than 500,000 prizes and rewards, and one lucky guest will walk away $10,000 richer. We’ve partnered with icons like Kennywood, the Pirates, the Pittsburgh Zoo, the Cleveland Metroparks Zoo, and the Carnegie Science Center for free tickets, plus we’re giving away free music downloads, movie tickets and even a trip to Aruba. As for Smiley, he’ll be making more than 40 appearances at restaurants throughout June and July. Plus, select restaurant locations will host our 60th anniversary celebration events. These events will feature Smiley and his Cookie Cruiser with special prizes, games, Smiley Cookie decorating and a Guitar Hero raffle at each event. The events will also feature special performances by the star of our new commercial, Nashville recording artist and Pittsburgh native Sarah Marince. Ms. Marince is the voice of our “Place for Smiles” jingle and she recorded a special rock version of the song especially for this promotion. Just click here for more details about Eat’n Park Rocks, or better yet, stop in to your local Eat’n Park for a chance to win! 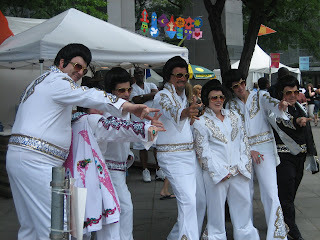 Michele Wright of WTAE met up with our Elvi at the Arts Festival, and she wrote about them on her blog! Click here to check it out.